An excellent heavy-duty live center designed to handle almost all manual and CNC turning jobs. Heavy-duty precision bearings provide exceptional radial and thrust load capacities. 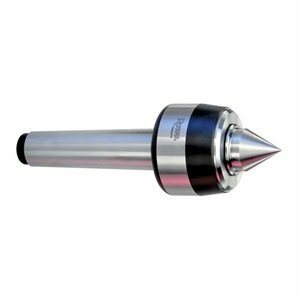 The thick, rigid point extends into the shank where it is supported by a large needle bearing for increased strength and vibration dampening. A high-capacity thrust bearing protects the center from excessive axial loads, one of the biggest enemies of any live center. Exclusive Roto-Shield coolant slinger and upgraded seal provide outstanding bearing protection for extended operating life. Body and point are hardened and ground for accuracy and durability. Guaranteed accurate to +/-0.00005" TIR or better. 1 year warranty against failure due to manufacturing defects.